David Titley is the nation's top climate security expert. 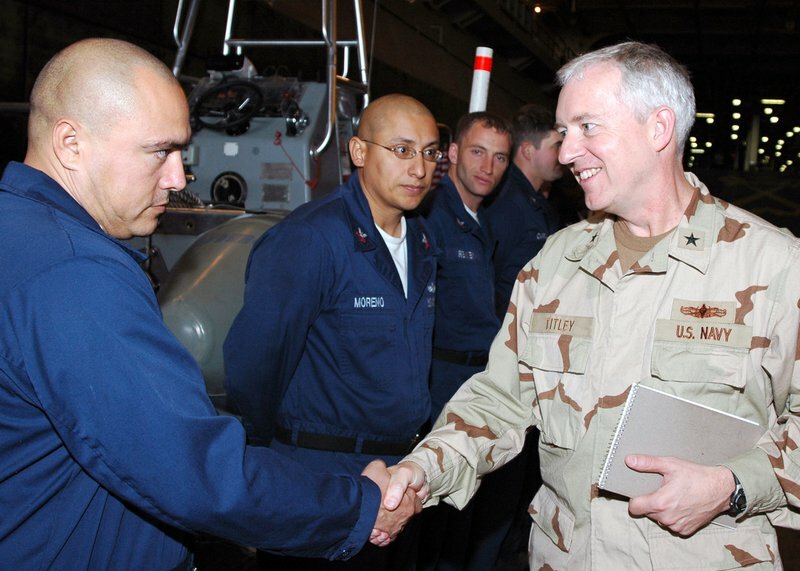 He served 32 years in the U.S. Navy as a Surface Warfare Officer, rising to the rank of Rear Admiral. That's unusual enough—few people make it that far in the U.S. Navy—but he is also a scientist, with a PhD in Meteorology. Rear Admiral Titley (now retired) read the new Pentagon report released on January 16th to Congress (you can download it here) and gave the Department of Defense a C+/D, or maybe an "incomplete." He graciously agreed to let me post the thoughts he shared with me on the report—they follow below. The strongest part of the report is the very first statement in the 'Background' section: "The effects of a changing climate are a national security issue...". The report also highlights a number of constructive efforts and initiatives the DoD is conducting in a rapidly changing Arctic (see my screen shots). Langevin’s amendment (a copy of which can be found here) directs the Secretary of Defense to provide an assessment of and recommendations to mitigate vulnerabilities to the top 10 most threatened military installations in each Service. It also requires the Secretary to address combatant commander requirements resulting from climate change over the next 20 years. Source: https://langevin.house.gov/press-release/langevin-amendment-climate-change-national-security-threat-passes-house-committee Langevin Amendment on Climate Change as a National Security Threat Passes House Committee | Congressman Jim Langevin - "During today’s markup of the Fiscal Year 2018 National Defense Authorization Act (NDAA), Congressman Jim Langevin (D-RI), Ranking Member on the Emerging Threats and Capabilities Subcommittee of the House Armed Services Committee, introduced an amendment to ensure that climate change is included as part of the United States national security strategy." This report does not identify the top 10 most threatened military installations in each Service. In fact no US Marine Corps bases are mentioned at all. Bases that have been recently devastated by climate-enhanced hurricanes, such as Tyndall AFB, also do not get a mention. Additionally there are no Combatant Commander requirements listed. What the report does provide is a number of anecdotes to daily base and humanitarian operations, most of which are driven by routine weather events or tsunamis and earthquakes that have no connection to climate change. Each service was free to use whatever data it desired (page 4). There is no apparent DOD standard for assessing the near- or mid-term climate future and impacts. The report is surprisingly clear though that there is no current or desired separate program to track or manage climate impacts. While stovepipes and programs have their challenges, the current DoD structure makes it virtually impossible to track and assess preparedness for a changing climate, either at the installation level or with the Combatant Commanders. Congress will likely not be amused by this report—I would expect some serious questioning to arise in the next few months at the annual readiness and budget hearings. The Pentagon should "standby for heavy rolls".